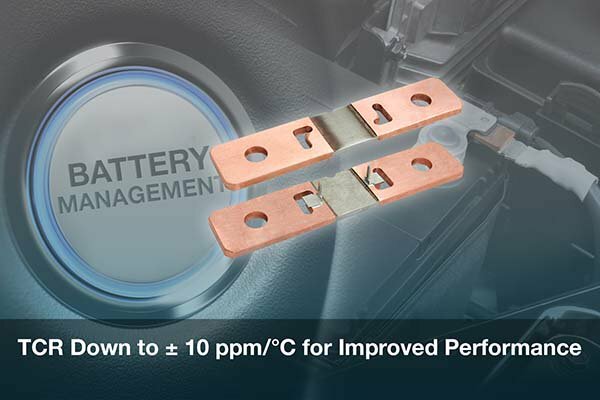 Vishay Intertechnology introduced the new WSBS8518…34 and WSBS8518…35 Power Metal Strip® shunt resistors with a solid metal nickel-chrome alloy resistive element with a calibration notch and "boot" design on their terminals, which improves TCR performance (down to ±10 ppm/°C) for better accuracy over temperature extremes. With extremely low resistance down to 100 μΩ and power ratings to 36 W, the Vishay Dale devices released increase accuracy and lower costs compared with manganese alloy shunts and Hall Effect current sensing solutions, while the two sense pins of the WSBS8518…35 aid in PCB mounting and provide consistent contact point locations on the shunt. Featuring an all-welded construction, the WSBS8518…34 and WSBS8518…35 offer low inductance values of < 5 nH, low thermal EMF down to < 1.25 μV/°C, and an operating temperature range of –65 °C to +170 °C. The resistors are RoHS-compliant, halogen-free, and Vishay Green.